Still undecided on whether or not you should plan a destination wedding? 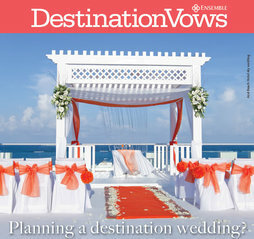 Here are 10 reasons to take the plunge from the editors of Destination Weddings & Honeymoons magazine. At some point in the planning process, every engaged couple entertains the idea of having a destination wedding -- after all, who doesn't get excited at the prospect of going somewhere gorgeous and unique to exchange vows? But at the same time, it can be daunting -- can you actually pull off a destination do? Will your loved ones be supportive? If you find yourselves debating "should we or shouldn't we?" or needing to convince some VIGs (very important guests) to embrace your decision, we're here to help. Here are 10 fantastic reasons to take your big day on the road. 1. You can say "I do" anywhere! A destination wedding is defined as marrying at least 100 miles from where the bride currently lives. So imagine the options that definition opens up for you -- the world really is your playground. 2. You'll stand out from the pack. More than 2 million American couples wed every year -- and fewer than 25 percent of them have destination dos. Bonus: Wed away, and you won't have to choose from the same old hometown spots all your friends have booked. 3. It's easier. Many wedding-worthy resorts offer free planning help to couples, whether the event is for two or 200, and an abundance of packages keep things simple while still giving options to customize. Want something more involved? Turn to an independent planner who specializes in more elaborate events. 4. You can save on decor. With a destination wedding in a stunning setting, your location of choice supplies the theme, from castle fairytale, to sea-inspired soiree. And when you choose an amazing backdrop, it doesn't take much to dress it up. Opt for a pristine beach, a tidy vineyard, a blooming garden or a historic plantation house furnished with graceful antiques, and you'll be more than covered with a few simple florals and other modest accents. 5. Enjoy quality time with loved ones. The standard wedding lasts for five hours, and the bride and groom spend most of that time running from table to table, trying to say hello to everyone. A destination do spans a minimum of three days -- which means, now that you've finally gotten your nearest and dearest together, you can actually spend quality time with them! Hooray! 6. It's a great excuse to limit the guest list. The very nature of destination weddings -- they require travel, a longer time commitment and hotel stays -- gives you the perfect excuse to cut down on an often unmanageable number of invitees. Think the second cousins and office mates will be miffed? You can always throw a post-wedding party -- complete with plenty of photos -- when you get back home. 7. Guests can save on a vacation. Ask your host hotel about discounted room rates for your guests; most resorts are more than willing to bargain in exchange for group business. Some airlines, such as United and American, offer discounted airfares for groups of 10 of more -- on the latter, this is true even if your guests are departing from different gateways. And ultimately, your friends will have a blast! Destination weddings give friends and family that most valuable commodity: downtime -- to kick back, connect and celebrate. And what's more fun than that? 8. You'll share a locale you love. Part of the joy of a destination wedding is showing off a place that has special meaning to you, be it bringing friends and family back to a beloved college campus, sharing where you took your first vacation as a couple or finally going to a locale you've always dreamed of visiting. 9. Flexible timing helps with budgeting. You'll be at your destination for a few days, so work with your vendors to see how timing can trim costs. After all, if everyone is already there, you can wed on a Friday, a Sunday or even a Tuesday -- what does the day of the week matter in paradise? Look at seasonality too. Many Caribbean hotels drop their prices dramatically in mid-April; by planning your wedding for May, you can get the same great digs for a fraction of the price paid by visitors a few weeks earlier. Likewise, mountain resort towns offer big savings in spring and fall. 10. You can start the honeymoon early. Just arriving at your destination is sure to put you in a relaxed mood as the pre-wedding festivities begin. Many hotels offer automatic upgrades to the bride and groom on their wedding night, and you may be able to negotiate an extended mini-moon at a reduced rate after the guests have gone home.